UNIX is an Operating system which is mainly developed to run on any computing devices. Unix is multiuser and multitasking operating system since several users can access the system and can do the several tasks at same time. UNIX or Unix was developed in ~1960s at AT&T Bell Labs by a special team including Ken Thompson and Dennis Ritchi initially to run only programs. It was first developed to work only in command line interface and later it was updated to work in GUI (Graphical User Interface) format like Microsoft windows. There are several variants and editions of UNIX released like LINUX, HP-UX, BSD, etc. Hardware: It is managed by kernel and this is the hardware part of system. 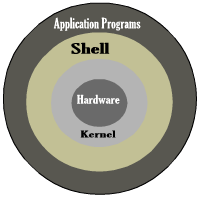 Shell: Shell is a command line interface which acting as a user interface between the user and the system. User will enter the command in terminal, shell acts as an interpreter here which interpret the user command and send it to the Kernel, where Kernel processes the commands and displays the output via shell terminal. Application Programs: we can run all the application programs like DBMS, FTP, MAIL, etc. Once the system is switched ON, you will be prompted to login in to the operating system. Note: If you are an administrator, you will create the login id and password while installing the operating system. Or else you should contact the system administrator to get the appropriate credentials. Then user should enter the password for their login id. Password will be displayed in encrypted form as below. Note: Both login id and password are case-sensitive. Once your login id and password are validated, you could see the command line with ‘$’ dollar symbol. Once you done with your works, you can logout from the system to prevent unauthorized access. Use command ‘logout’ or ‘exit’ to logout from the system. If you have any doubts or clarifications please comment below.